Perkins+Will created a Japanese-inspired design for the offices of Trend Micro, a global security solutions company, located in Irving, Texas. Known for consistently incorporating thoughtful design and future-forward solutions into the workplace, lauckgroup, now Perkins+Will, has been a long time partner of security software company Trend Micro. As a company that is constantly innovating both in terms of product and place, Trend Micro has been restoring its various locations around the world with the help of the design team’s expertise for over a decade. In their most recent project for Trend Micro’s growing North American Headquarters, the team reimagined the office’s 13th floor as a way to break down hierarchical barriers within the multicultural company, opening up employees across all levels to facilitate daily collaboration. 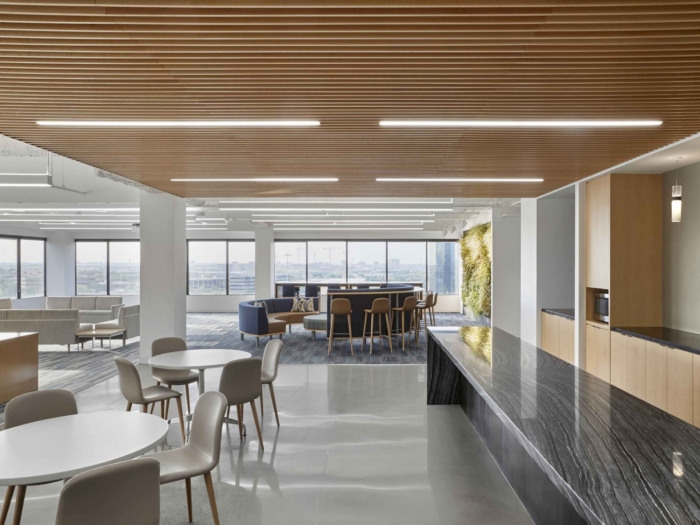 The new 13th floor, referred to as “the Kitchen,” features a large reception space, welcoming Dallas staff and visiting executives into the heart of the organization as soon as they step off the elevator. Adjacent to the reception, guests are invited to convene in the tatami room. The space was built to encourage wellbeing, not only from a fitness standpoint but a mind-body perspective. Recalling Trend Micro’s Japanese roots, the tatami room is designed using the company’s signature maple wood slats, signifying the zone as a place for people to connect. The room serves as a gathering point for company events, catered dinners, yoga classes, traditional tea ceremonies, and individual meditation. Prefacing the entrance, guests enter the shoe storage room, outfitted with a series of backlit boxes for individual belongings. Custom panels upholstered in traditionally-inspired fabrics were used to line the boxes, offering an additional nod to Trend Micro’s heritage. As visitors enter the ceremonial space, they are invited to take a seat atop custom-designed furnishings and floor cushions reminiscent of the pieces often found in Japanese tearooms. The floor is composed of traditional tatami mats, extensively researched to assure the application would hold up in a high traffic space. Delicate, hand-carved Japanese wooden screens run up each window of the room, offering supplementary texture and unique forms of natural light throughout. Soft, acoustic, automatic curtains stored in discrete paneling allow users to subdivide the space and provide privacy for multiple groups. Once the ceremony has drawn to a close, the furthest wall of the tatami room opens to reveal a large contemporary pre-function room that serves the catering needs of the space. This is the first tatami room that lauckgroup, now Perkins+Will, has designed within an office space, promoting alternative types of design and wellbeing as a means of personal restoration for users. As visitors continue through the space they are met by an oversized break room and lounge. A group of open desks for traveling and in-house executives were designed to encourage spontaneous engagement with flexible seating arrangements. This strategy allows the executives to be more accessible to Dallas team members, highlighting Trend Micro’s dedication to increasing communication and interaction within the various team structures. The open concept seating for executives challenged the design team to create a balance of open and private space amidst the 13th floor’s open concept. Numerous meeting spaces, ranging in size and type, provide breakout zones for executives and employees alike, to meet or complete heads-down work. The team also built in a limited number of private offices next to to the break room, offering execs the option to take a call or meeting from a private desk setting.